Ever dreamed of internet speed in Gigabits? It may be possible soon in India. If you live in India and a very active internet user, you may sometimes get frustrated due to ridiculous capping rules, low speed and poor customer care. Those days may soon become history as recent reports are coming out that Google is planning to start Google Fiber in India, which offers speed upto 1Gbps, and Google may introduce the Google Fiber in India in 2015. For now, talks are going on between Google Fibre Team and the IT Ministry . An IT Ministry official spoke to Business Line and said, “We are keen to partner a company like Google in furthering the Digital India plan. Modalities have to be worked out,”. So, now you can imagine downloading a HD movie in 33 seconds flat; uploading 100 images in 5 seconds. Check out the video below to see how Google Fiber works. Google Fiber is Google’s own broadband internet service which offers speed upto 1000 Mbps or 1Gbps, and when we are living in an era where people need to face problems in each step they take on the world wide web, this may certainly be a turning point for Indian internet users. 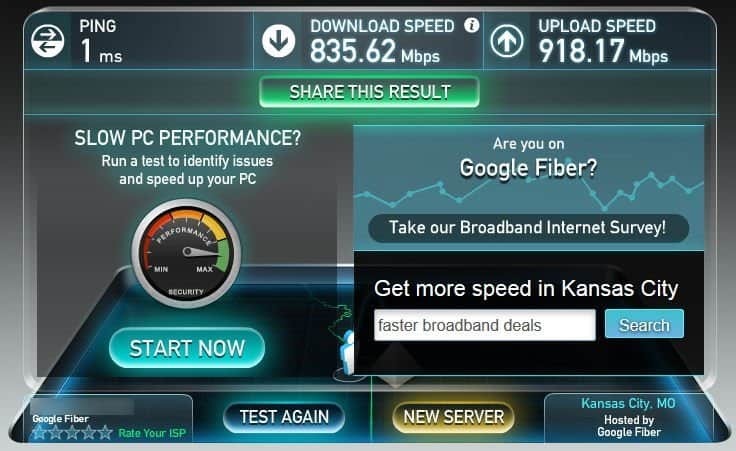 And below is screenshot of a speed test by a Google Fiber user from Kankas City, the city where Google Fiber was introduced first. Google is planning to expand their service in 34 more cities. Though Google officials have not spoken in detail, but they stated that they are working very closely with the Indian Government and an official from IT spoke to The Hindu and revealed that a team from Google is arriving in India soon to do feasibility studies about Google Fiber in India. Next articleNet Neutrality in India: What will change and what is the future?